Σε περασμένες δεκαετίες συχνά οι εγκληματίες χαρακτηρίζονταν ως ψυχικά ασθενείς και το δικαστήριο τους αθώωνε ως τρελούς (περίπτωση του Ντάρχαμ 1954). Ειδεχθή εγκλήματα που σόκαραν την κοινωνία μας τα τελευταία χρόνια, δεν φαίνεται να σχετίζονται με ψυχικές νόσους. Ωστόσο το ερώτημα παραμένει: Ψυχασθενής ή εγκληματίας; Οι εποχές που οι σχιζοφενείς κλείνονταν σε ψυχιατρεία έχουν παρέλθει, αλλά η σχιζοφρένεια περιφέρεται παντού. Μπορεί και στο διπλανό μας σπίτι. 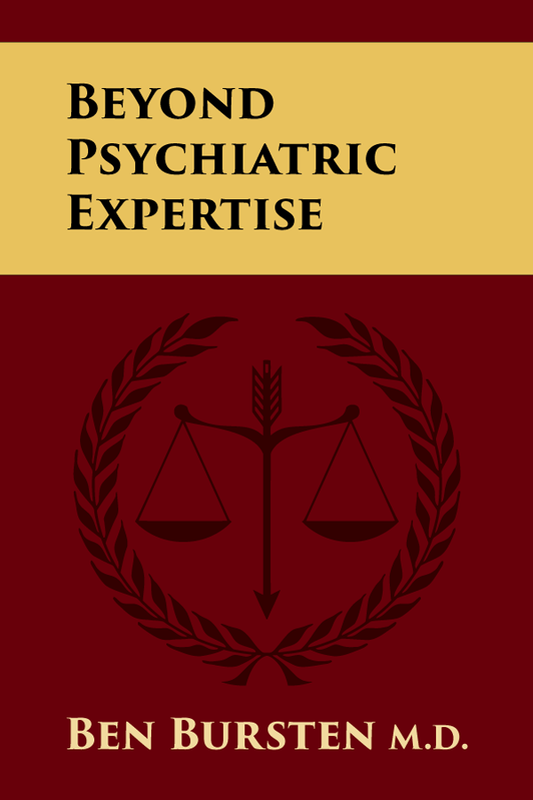 Το βιβλίο "Beyond psychiatric expertise" στις 700 σχεδόν σελίδες του, αναλύοντας τα δύσκολα παρακάτω ερωτήματα, συγκρίνει περασμένες εποχές με τη σημερινή αντίληψη για τη σχέση νοητικής αρρώστιας και ειδεχθούς εγκλήματος. Μερικά αποσπάσματα πολύ χαρακτηριστικά που αφορούν το νόμο και τους ψυχιάτρους. "Questions are daily put: Is one “sick or criminal?” “Sick or praiseworthy?” “Sick or sinful?” “Sick or uneducated?” “Sick or unwise?” “Sick or lazy?” “Sick or malingering?” “Sick or manipulative?” “Sick or merely unpleasant?” “Sick or inexperienced?” These questions lie behind decisionmaking, not only when they are presented directly. They are constantly put to experts in the area of behavior and mental illness". "The law asks the physician to decide whether there is a “decisive, determinative, causal” relationship between the disease and the act. There may be sick and healthy aspects of mental functioning, however, within the same person". "What do we mean when we say that certain behavior is a product, or a feature, of mental illness? One could say that mental illness tinges all aspects of the thought processes of the individual, and that every act of the individual is at least partially affected by mental illness". "The psychiatric task was to decide if this behavior was a product of mental illness or merely representative of a life-style. 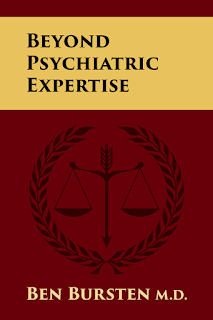 The phrase product of mental illness is known in forensic psychiatry as the Durham standard. Monte Durham was a misfit". "How does a psychiatrist decide whether the cluster of characteristics constitutes an illness? Probably the first criterion that occurs is suffering. Pain, discomfort, malaise, and distress would seem to be the hallmarks of sickness". "Psychiatric research seems to be on the threshold of discovering the neurochemical underpinnings of schizophrenia. With discoveries such as these, will schizophrenia no longer be a mental illness? Will it be a neurological or physical illness?" "A person can be partly mentally ill and partly well. In examining several areas of mental functioning, it may be found that some of these fit the criteria of illness while others do not". "Society has become alarmed by an everincreasing crime rate and the fact that a defendant such as John Hinckley, who attempted to assassinate President Reagan, was found not guilty by reason of insanity. The public and the politicians are in no mood to have much compassion for serious offenders". "One must be very careful about the use of the words freedom and liberty, because they are sufficiently ambiguous to be used in rhetorical advantage. The liberty referred to in this book is an immune right—freedom from government intervention. Advocates of compulsory treatment will often argue that they, too, are for freedom— the right of the individual to be free from the crippling effects of illness. This is not an immune right; it is a claim and thus is a very different (even if important) type of freedom". Is it any wonder that in more primitive times medicine and religion were one and the same.